What is the best ninjato sword you can buy online in 2018? That’s exactly what we are going to look into today. With our buyer’s guide below we set out some of the considerations you should have before buying a ninjato. We have also pulled together 5 of the best swords currently available covering a range of price points. If you’re looking for a ninjato we are positive one of our selection will perfectly meet your needs. For our results at a glance, just head to the quick help table below. For full, in depth reviews of each sword – keep on reading. What was the ninjato used for? So what is the Ninjato Sword? The Ninjato sword is an interesting ninja warrior tool that comes in various guises depending on the historical account you follow. 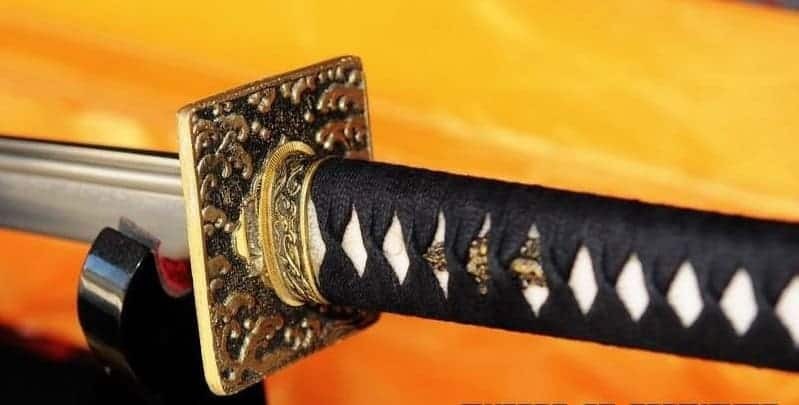 However, the most commonly accepted form of the Ninjato is a short sword with a straight blade (along the lines of the Shikomizue or Joto) and a rectangular guard. This description stems from one of the few reliable pieces of historical evidence that can be connected to the Ninjato. On display at the Iga-Ryu Ninja Museum in Iga Ueno, Japan is a ninjato (or shinobi-gatana) with the accompanying description. However, although many modern day reproductions follow the above design, it is also possible to buy Ninjatos that resemble the popular western depiction made popular in American martial arts films during the 80s. Here the ninjato is constructed as a sword with a straight blade and square hand guard, (or tsuba). When buying a reproduction Ninjato online there are a few issues you should consider before parting with your hard earned money. Let’s take a look at a few of them now. First and foremost you should do your research to ensure that the company you choose to build the sword has a good reputation. Here, previous customer reviews and comments are important. Also, you want to be sure that the company has the relevant expertise (skilled craftsman, using the correct materials and forging processes) to create the work of art that you will be proud to hang on your wall or use in the dojo. The company we recommend above all else is Swords of Northshire. Their hand crafted, built to order range of swords and historical weapons are some of the best in the business. However, what really sets them apart is the customer service. From your first email or telephone enquiry, to the moment your new sword arrives at your door, the communication and support is absolutely top notch. They want to make sure you are 100% satisfied with the results and the team there go out of their way to make that happen. Whoever you choose to build your sword their reputation has to be your first concern. We touched on this above. Spend some time to read up on the processes the company uses to build their swords. The higher price you pay, the more attention to detail you can expect. Hand forged craftsmanship really is key if you want a sword that will last a long time and look beautiful to boot. What kind of steel is the blade being forged from. This chart here will give you an idea of the different grades. 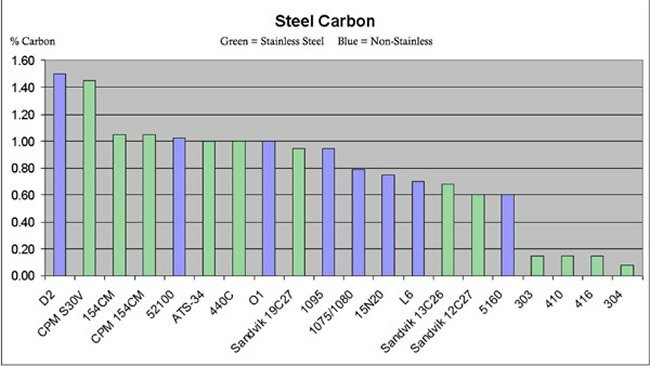 Many companies opt for high carbon steel for its strength and anti corrosive properties. However, you should not stop there in your research. The material used for the scabbard, handle and decorative motifs needs to be considered. All of this is clearly a balancing act with your allocated budget, however you should aim to buy the best ninjato you can afford. 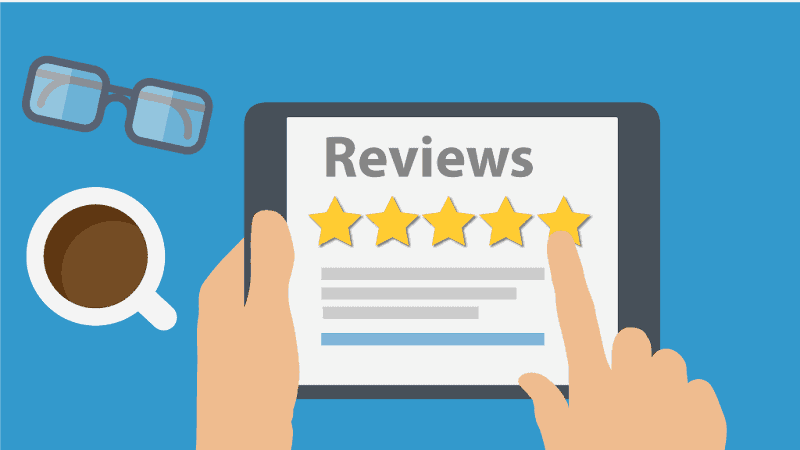 The reputation of a company is based on previous customer reviews and opinion. Take time to see what other sword buyers have purchased and their experience doing so. Websites such as Sharpen-up also have a big part to play. We have done a huge amount of research for this article so you do not have to. 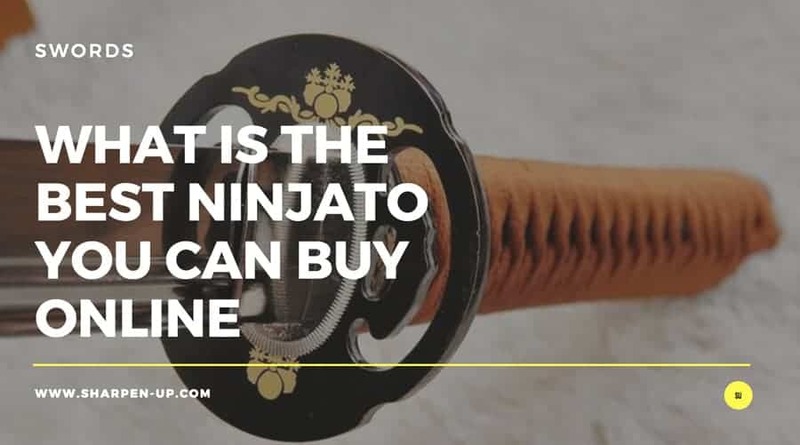 By bringing together some of the best ninjatos currently on the market into one place, we aim to give you a head start when it comes to choosing your new, beautiful sword. Finally, pay attention to any of the extras. You don’t want any surprises when it comes to shipping costs or duration. Take into account that a hand forged tool made to order, may take a few weeks to prepare. Are there any warranties offered on the product? Can you get in touch with someone at the company with ease? How much input can you expect on the design process? These are all important considerations you should have when ordering your Ninjato. We’ve gone through a short history of the ninjato, as well as some important details you need to remember when buying. Now it’s time to look at our updated 2018 list of top choice ninjatos. No matter your budget, one of the following swords will cover your needs and then some. Our top pick katana ninjato sword is the product of true craftsmanship. Hand forged using traditional Japanese processes, this perfectly balances a beautiful aesthetic with ultra strong performance. And all at a very affordable price point. The strength of the blade is impressive too. The steel has in fact been folded a total of 13 times during the forging process. This results in an incredible 8,000 layers. Considering the hand polished finish provided on this full-tang beast, you will have yourself a formidable dojo tool or impressive wall hanger (whatever your preference). The manufacturers state that the sword is sharp enough for cutting tameshigiri and bamboo, which certainly lends itself to cutting practice. However, the adornments also make it a very beautiful display piece. 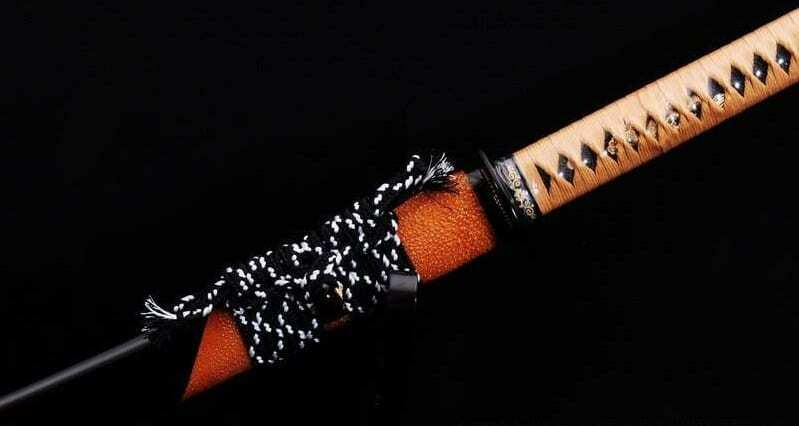 This ninjato comes with a black lacquered hard wood saya and silk sageo/ito. Additional features such as the copper fittings and genuine same (rayskin), only add to the overall quality finish. Two bamboo mekugi fix the tang to the handle. There is also the option of a hand engraved Mei (signature). 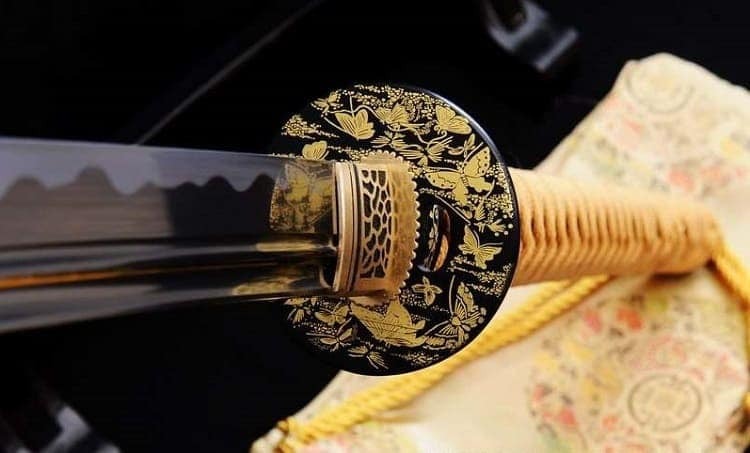 Like all the offerings in our top 5 list, each sword is individually handmade. This does alter the specifications from sword to sword, but also provides scope for some individual customisation. This Hand Forged Folded Steel Straight Blade Katana Ninjato, gets our top pick because it is excellent in-way to owning a quality ninjato. The strength and build quality is there, as is the beautiful aesthetic. The user reviews have also been extremely positive on this katana, ninjato sword (head here for more on that). Traditional Japanese hand forged processes at a very affordable price; what more could you ask for? 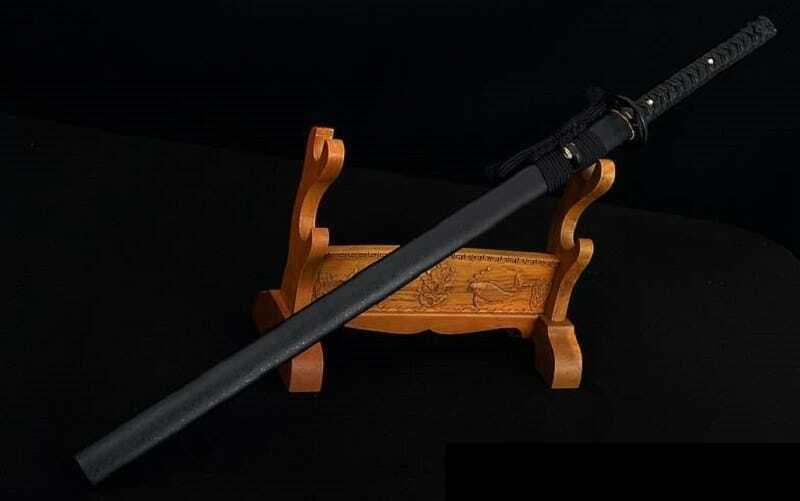 This Nagamaki sword beautiful example of a katana, ninjato hybrid that combines the beautiful aesthetic of the display katana, with the strength and flexibility of a sword suitable for the dojo. The high quality 1095 high carbon steel used in this beast make it one of the strongest swords in our top 5. The clay tempered processes involved in the creation of the sword both adds to the look and overall build quality. The blade is repeatedly heat treated, the hand forged processes also ensures that impurities and imperfections are removed from the steel. The end result is a superior full tang blade that after being hand-sharpened by the boffins at Swords of Northshire, is actually suitable for battle. The structure of the sword actually makes this a very unique offering from the guys at Northshire. Here they have opted for a a mix between a Katana and Naginata, with a Unokubi-Zukuri blade shape. The pictures speak for themselves; the results are really quite stunning. The pleasing aesthetic and overall quality extends to the various extras that come with this sword. The black lacquered hardwood saya with rayskin wrap just oozes class. Add that to the buffalo horn koiguchi, silk sageo/ito, genuine same’ (rayskin) and you have a sword worthy of any superior display case. The full tang is secured with two bamboo mekugi. This will also feature a mei (signature) to finish that authentic Japanese look completely. 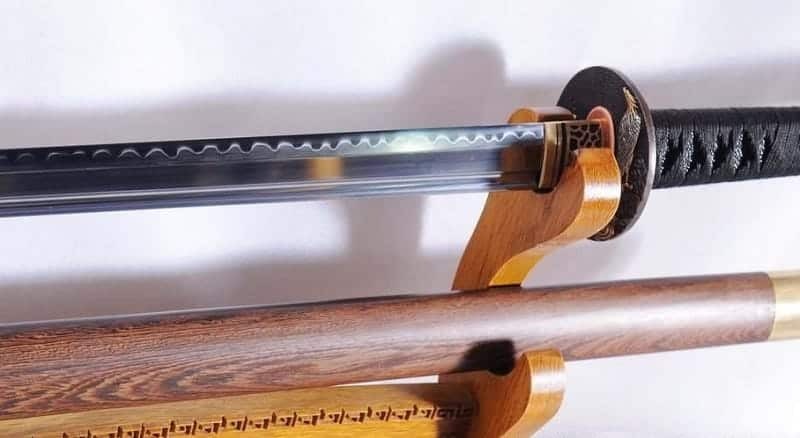 Durable enough for cutting through tameshigiri, bamboo, bones and iron wire, this sword is equally at home while being used for cutting practice and dojo use, as it is as being part of a display collection. The design differs slightly from a genuine ninjato which may not be to everyone’s taste. The most refined sword in our top 5 list, this is an impressive build. You are paying a bit more for the top-notch finish, but for those looking for a unique sword to add to the collection, this will tick the right boxes. However, if a true straight edged ninjato is what you are after, you may want to look elsewhere. 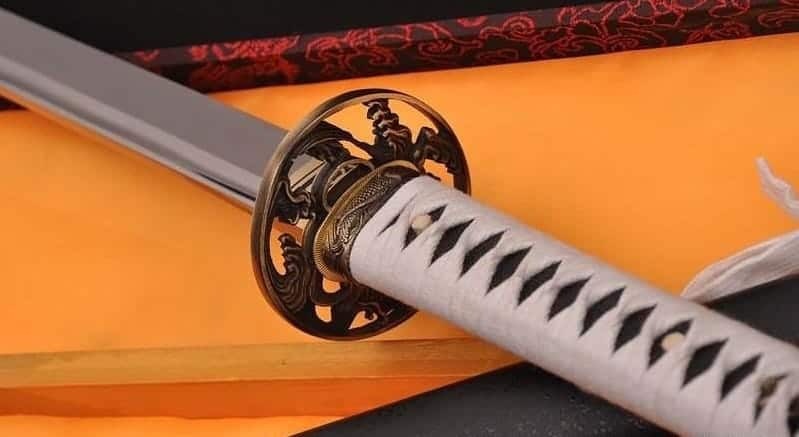 This well-made (and rather colorful we might add) folded steel sword is one of the cheapest to make our top 5, however the lower price point does not mean low quality construction. The rather striking black finish on the blade is a result of an etched oxidation process conducted after sharpening. The black matte hard wood saya and silk sageo/ito help compliment the overall aesethetic. The sword also comes with brass fittings and genuine same (rayskin). Overall a good budget choice ninjato whether you’re a dojo student, planning on practicing your techniques in the yard, or simply wish to display it. As the budget choice in our top 5 ninjato review round up, this sword will certainly win a few fans. The quality is there but all in a sub $200 price point. If you are after a cheap practice ninjato this probably is the best one to buy. 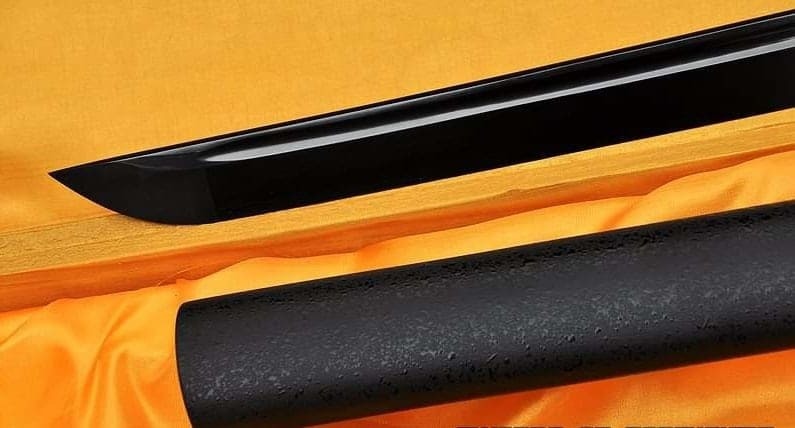 However, if you are more serious about your dojo tools, or want the quintessential wallhanger to impress, our number one pick katana, ninjato is the more worthy choice. This blade on this premium Ninja sword is made of 1095 high carbon steel. Not only that, but the finish is clay tempered so that after being hand polished you have an immaculate mirror-like surface. And in many ways this is a sword designed to be displayed. The clay temper process also results in a genuine hamon (temper line) that runs along the blade. The pictures do not do justice to how much that adds to the overall aesthetic. However, don’t be fooled and think this sword is all ‘bling’ and no substance. This is a very strong blade that can be used for multiple applications. For cutting purposes you can practice on everything from tameshigiri and bamboo, to harder materials such as bone and iron wire. The pleasing aesthetic continues with the addition of the black matte hardwood saya, silk sageo/ito. A genuine same’ (rayskin) is also included. Premium brass fittings are used throughout. A high quality ninja sword with some very fine aesthetic features. The craftsmanship also extends to the overall strength of the sword. Fantastic as a wall hanger, but maybe just too beautiful to use for practical purposes – the choice is yours. This hand forged Ninjato sword is made from 1060 high carbon steel to ensure suitable strength for training and dojo use. 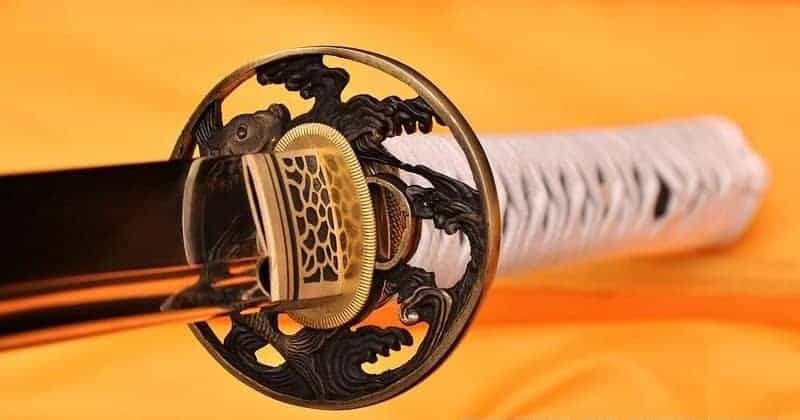 Japanese methods have been employed in order to create this sword, which is in fact highly recommended for iaido and kenjutsu use. Much like the other swords in our top 5, the blade here is heat-treated and tempered. The hand-crafted process also involves a oil quenched finish. This helps to harden the blade while also maintaining optimum levels of flexibility. For that very pleasing black blade finish, the steel is hand polished with multiple grades of sharpening stones, before an oxidation process is employed to give you that stark, jet black colorization. The sword also comes with a black matte hard wood saya, silk sageo, and synthetic leather ito. Premium iron fittings are used to hasten the various elements into place. You will also receive a genuine same (rayskin) if you purchase this ninjato. More budget friendly than the premium picks in this top 5 best ninjato sword roundup. However, this is evident in the overall finish. A very good sword for the price however. 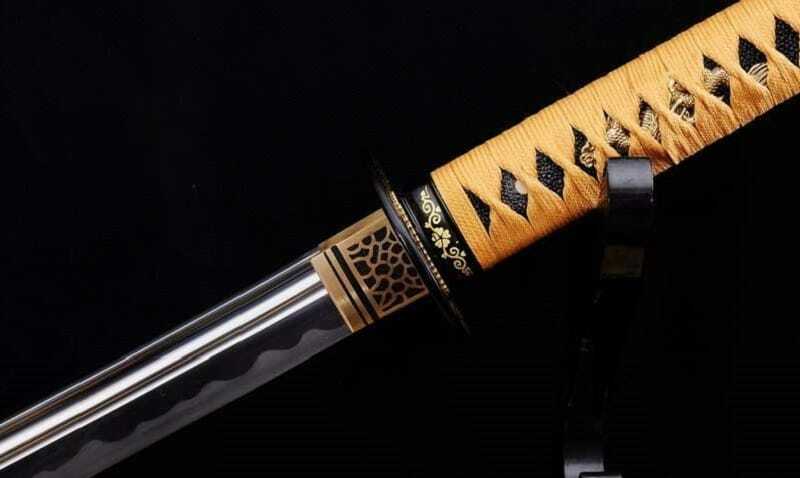 The shortness of design leads experts to believe that the ninjato is closely connected in design to the tantō (a variant of Japanese short swords/daggers). However, there are indeed more interesting theories that suggest the ninjato was the offspring of the wakizashi (Japanese short sword). Swordsmiths instead fitted the short sword blade with a Nodachi sized handle that could be carried in a Katana-length scabbard. A third theory extrapolates from the reality of the ancient battlefield post combat. It is suggested that broken blades were picked up and recycled to make the ninjato. The shorter size blade in the larger scabbard would also fool the opponent into thinking you had a longer sword than you did. The opponent would be surprised by the speed with which you could draw the sword. By the time they were able to react, the blade edge had already made contact. The short dimensions of the ninjato meant it was primarily used as a slashing sword. It could also be used indoors as the shortness of the blade allowed for manoeuvrability in confined spaces. A straight bladed ninjato could also be used by ninja to assassinate the samurai. Close quarter stabbing could be efficiently carried out with this sword.